We stayed in the Medina, which is the ancient part of the city surrounded by walls built in the middle ages. It is filled with beautiful palaces and mansions, many of which are now boutique hotels. But instead of staying in a hotel, we stayed in a riad - an actual home or palace with an interior courtyard that has been converted to a small “bed and breakfast.” The L’Orangeraie was a quaint and beautiful riad, and the service was ﬂawless. There was a rooftop terrace where we ate breakfast every morning, and each night we would watch the sun dip behind the snow-capped Atlas Mountains. Though peaceful in our riad, we were only yards from the thrumming labyrinth of merchant and food stalls in the Medina. The main square, Jemaa el-Fnaa, is bustling with vendors selling fresh-squeezed orange juice, dried fruit, spices, plants, textiles and leather goods. Snake charmers, storytellers and musicians only add to the vibrant ambiance. At sunset, the entire square transforms to accommodate food vendors, where intoxicating scents of freshly grilled meats and traditional Moroccan tagine fill the air. Vivacious entertainers and dancers perform for tips through the square, while female retailers sell their beautiful candle lanterns and statues to tourists. This frenetic scene repeats every evening and continues well-past midnight. I could have spent my entire trip exploring the souks (marketplaces) of the medina, but my real purpose for travelling to Marrakech was to learn all I could about preparing Moroccan cuisine. For three days, our small group enrolled in cooking classes that specialized in Moroccan cuisine. My favorite class was the ﬁrst day when we went to La Maison Arabe. The cooking school was nestled in the middle of a lush, colorful garden, and is one of the most well-designed schools I have ever seen. The cooking stations were perfectly organized for each of us to cook our own tagine, zaalouk - a cooked eggplant sauce - and fresh tomato and chile sauce, a perfect accompaniment to fresh Moroccan bread. 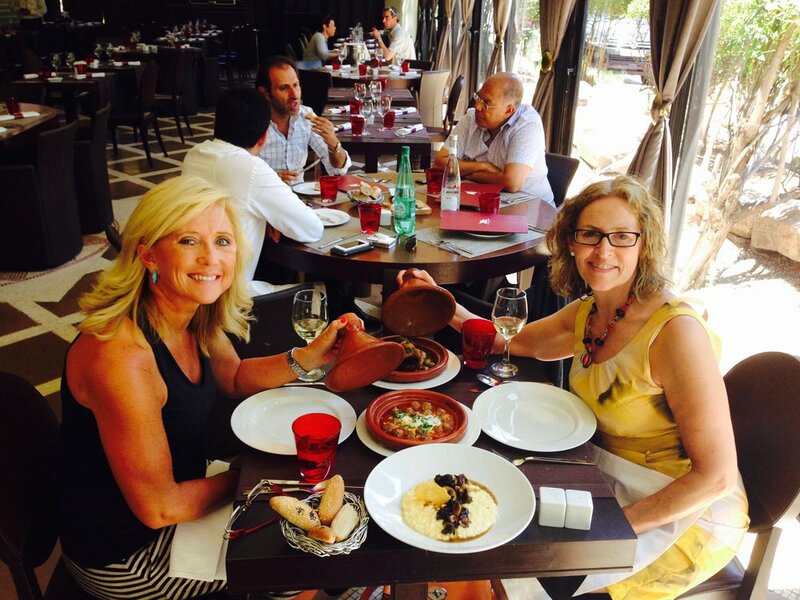 Our next culinary class was at the Riad Monceau, a delightful riad near the main square. The kitchen was very small for a cooking class, but the Seffa with chicken, raisins, and almonds was one of the most delicious dishes I experienced during the entire trip. It is a vermicelli dish that is typically made during holidays since it is quite time consuming. I am looking forward to making my own in my own kitchen, and sharing the recipe with you, soon! For our final class, we trekked two-and-a-half hours to the seaside city of Esaouira to attend L’Atelier Madada cooking school. It was very well organized and Alison, the main instructor, was extremely knowledgeable. We spent the morning making our lunch of seafood pastilla, a large, golden, pie-shaped pouch of flakey dough filled with a robust seafood filling. After lunch, we spent the rest of the afternoon making “gazelle horns,” a decadent Moroccan pastry ﬁlled with homemade almond paste. When we weren’t spending time in our kitchen classrooms, my other cooking partner and roommate, Rachael, and I hit the markets to find traditional spices commonly used in Moroccan cuisine, like anise seeds, za’atar, cumin, saffron, chiles, preserved lemons and argan oil. As we strolled through the winding paths of the bazaar, I saw local women making Moroccan bread, a staple in every meal. The women would expertly knead the dough, press it into round discs, then take it to a community earthenware fire oven—a shared oven everyone in the area uses to bake bread for their families. The women marked their dough with unique knife marks, like a signature, so they could identify their own loaves after they are baked. In addition to spices and oils, Marrakech is known for the textiles made from “cactus silk”, which is produced from interior fibers of certain type cactus. I saw several men weaving the plant fibers and dying them for carpets, bags, and scarves. I stumbled upon a boutique with original designs by a Moroccan designer, Salima Abdel Wahaab. Her clothing is so unique and lovely. I bought three pieces that I will keep forever as reminders of my wonderful experience in her country. Another lovely place I visited while in Marakech was the Majorelle Garden, a 25-acre oasis of exotic plants, water lilies, and lotus flowers that bloom under canopies of flowering ivy. Inside, there is a memorial to the late Yves Saint Laurent, who purchased the gardens in the 1980s. The gardens also house The Berber Museum and Art Museum of Marrakech, which features a collection of textiles and jewelry owned by Saint Laurent. 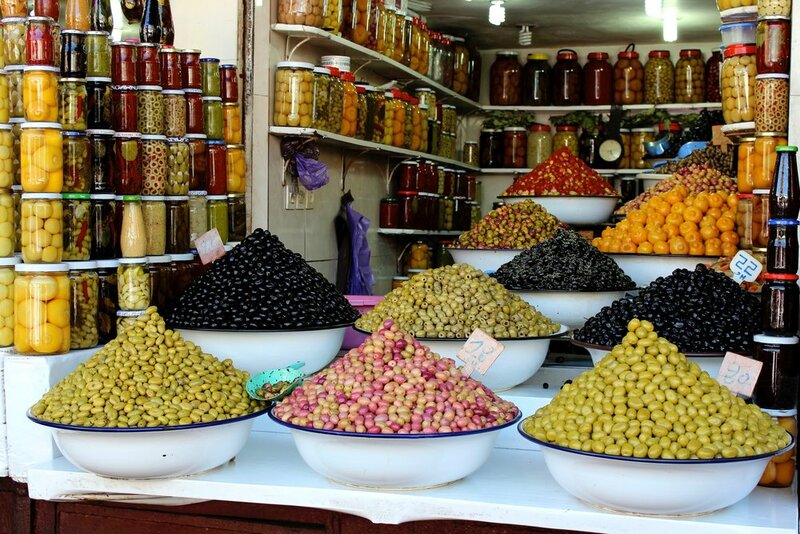 Marrakech is a feast for the senses, with so many things to see, do and, of course, eat! I look forward to returning with my family for a relaxing trip to further explore this colorful city, its surrounding countryside and the Atlas Mountains.